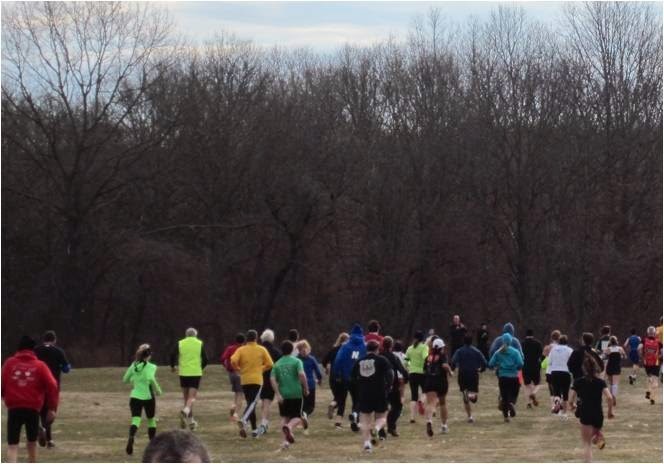 The weather finally cooperated enough to allow GLIRC to run the Runner's Edge Relay this morning. 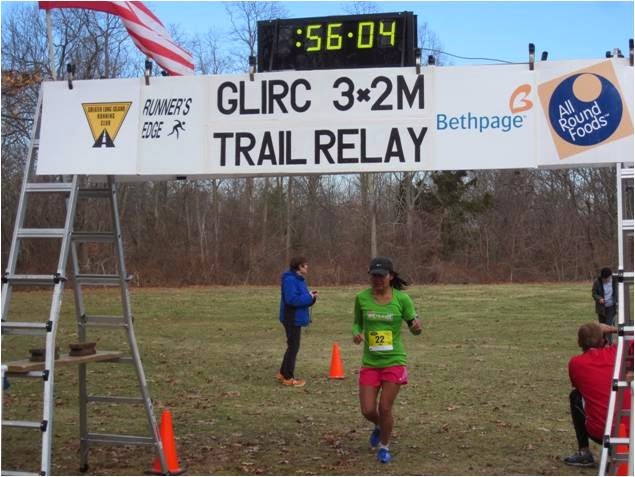 This race was originally scheduled for February, but the unrelenting snow had made the trails at Bethpage State Park unrunnable. A little rain and a few days of 40 degree temperatures cleared out most of the snow, although there were still a number of icy and muddy sections along the path. As the name implies, this race is a team effort with each member running one 2 mile leg. I haven't been running well this year, but I did a few speed oriented treadmill runs earlier in the week and figured two miles wouldn't be much to worry about. I was wrong about that. Today's two miles didn't feel endless, but I had much more difficulty that I'd expected. It was too late to help my teammates, but I discovered a large gap in my conditioning that I hope to address as I begin my half marathon training. 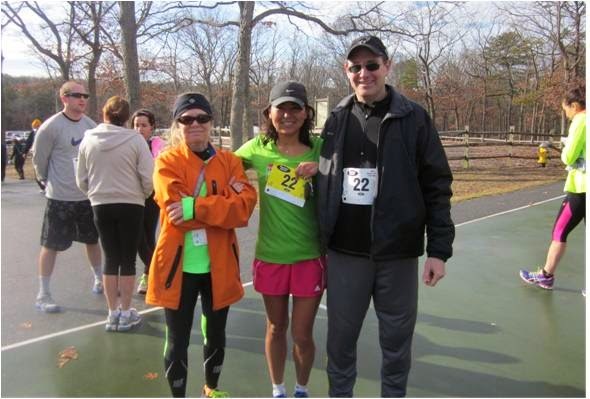 Our team was called the Runsketeers, consisting of me and friends the Petite Pacer (TPP) and She Is Out Running (SIOR). SIOR had little prior trail experience, but she's lightning on the road. She qualified for Boston this year and almost always wins or places in her age group. TPP is also very fast (she has racked up her share of podium spots) and takes performance training very seriously. Then there's me. I used to be competitive in my age group and I've done a lot of trail running. These days I struggle to break 28 minutes in a 5K. With that lineup, we decided to have TPP run the first leg, me the second and have SIOR bring it home. The idea was that TPP would put us in a competitive position, I would do my best to hold that and SIOR's speed would help gain back minutes and position. We didn't really discuss it, but that was my reasoning. TPP has been feeling under the weather this week and is still fighting a fever. 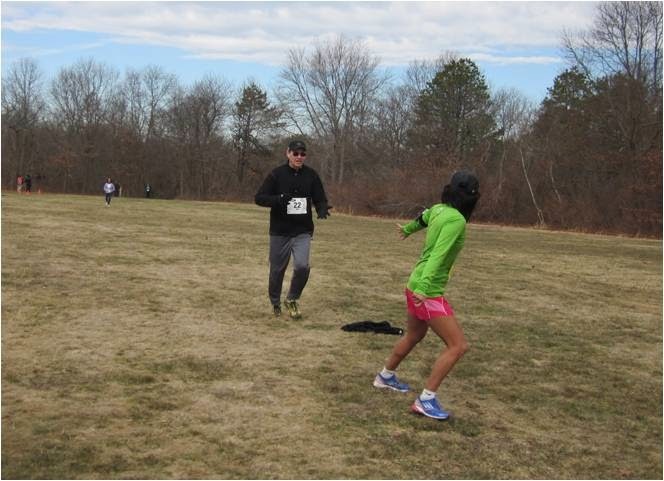 She's a tough competitor but decided to run despite feeling sub-optimal. Our backup plan was either to have Mrs. ER run TPP's leg or have me or SIOR run two legs. We ended up with the original lineup intact. SIOR's marathon schedule had her running 10 miles this morning prior to the race. She anchored our team after doing that long run on the hilly Bethpage bike trail. These women are amazing. 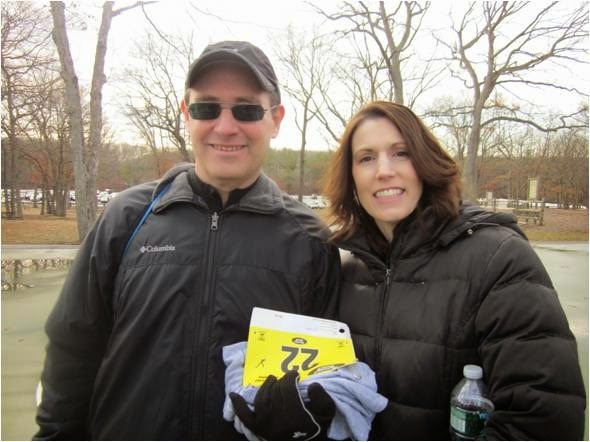 Team ER arrived at Bethpage around 9:00 AM and I collected our bibs and t-shirts. SIOR and TPP arrived about 20 minutes later. It was nice bringing together my running friends and my family. Our talking kept our minds off the fact that it was very cold and we didn't have any place to keep warm. There didn't seem to be that many participants, but the crowd grew as we got closer to start time. We headed over to the starting area a little before 10:00 AM and the race began on time. Each leg started on the open field and led to a path into the woods that eventually connected to the main trail. TPP and the others disappeared into the distance and I was still thinking this would be relatively easy as races go. It wasn't that long before we spotted TPP exiting out of the woods from the opposite side and soon enough we slapped hands and I took off for the second leg. I made the mistake of starting too fast and I paid for that later in the run. The trail conditions were (at best) wet and stable, and (at worse) muddy, icy, snowy, sandy and slippery. There were plenty of race volunteers along the course to keep us on track and warn us of trail dangers. I was disappointed to feel overtaxed midway through the leg and I slowed considerably when running in areas of deep mud and sand. Bethpage doesn't have hills like Stillwell, but this course did have its uphill challenges. I was not in great shape by the time I reached the field. 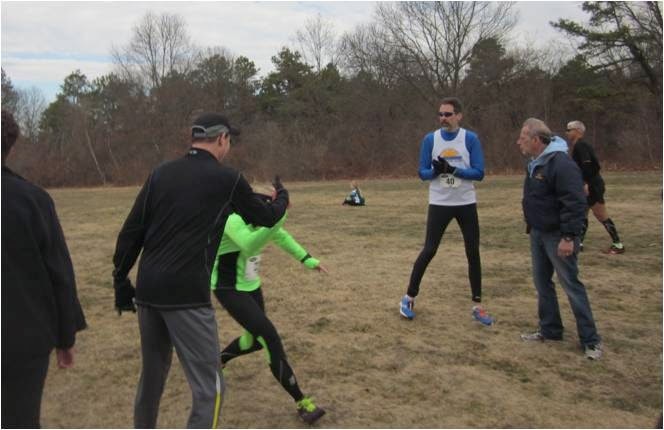 My family described my "sprint" to the relay hand-off as "slow motion." SIOR took off quickly and gained back some minutes. We all gathered near the finish line chute and saw her come through after covering her leg in about 16 minutes. There are no results posted, but her effort undoubtedly helped our race position. 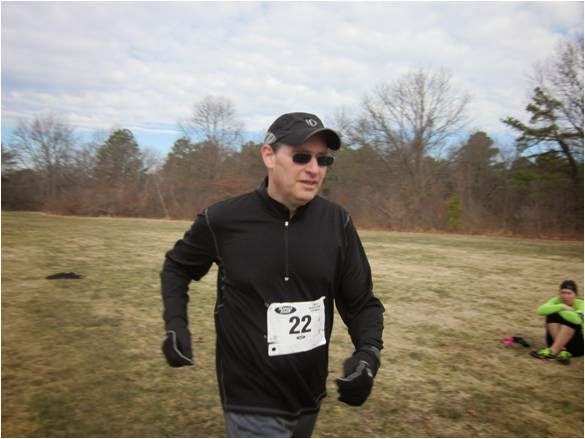 PHOTOS COURTESY OF EMERGING RUNNER JR. The reward for our hard work was found at the food table where they served muffins and cupcakes as big as softballs. They also offered hot chocolate and noodle soup that was described by my wife and kids as "fantastic." I had a great time although I am disappointed with the way I ran. I'm determined to get back to my prior level and I have a training plan that I think will help. My Runsketeer teammates both put in impressive runs and I'm honored to be part of that group. 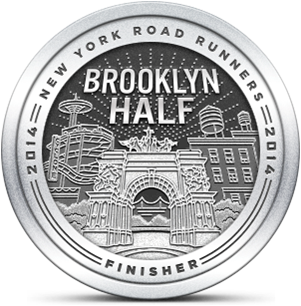 I may return to Bethpage tomorrow to do my first Half training run. It's just five miles, but today was only two and that was no picnic. That was a very technical course, even though it was fairly wide. Your family is delightful! Don't be too disappointed. Things will change for you once the weather improves. It's been winter waaay too long. You did an amazing job yesterday and it was lots of fun. The family loved talking to you! I need to get some more middle distance runs in to help me understand my level of fitness. Today's run was tough and a little disappointing, but I'm hoping the base training will return some benefits.